Passengers aboard a whale watching boat catch a close up of a male Orca wake riding off Northern Vancouver Island in British Columbia, Canada. A male Orca catches a ride as he does some wake riding behind a whale watching boat which is one of an Orca's many behavioral traits that they love to do. Not only is this Northern Resident Killer Whale enjoying himself wake riding but the passengers aboard this boat get a thrill of a lifetime. 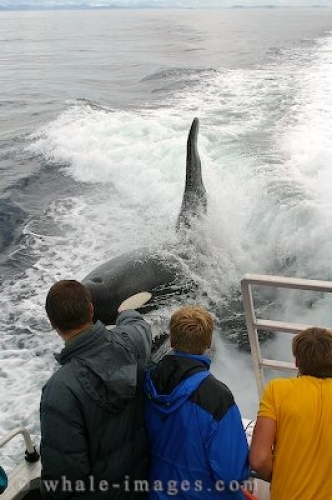 Once in a while a killer whale will jump into the wake of a passing boat which gives passengers a rare opportunity to see how magnificent they are. This male off Northern Vancouver Island in British Columbia, Canada lets you have a look at his blowhole, eye patch and tall dorsal fin as he surfaces for air. When an Orca is wake riding you need to watch very closely as they seem to hang out by the prop of the boat and it is hard to see where they are in the wash. You can be searching relentlessly for them and all of a sudden they are within arms length of the boat and you may even be sprayed from their blow when they surface. off Northern Vancouver Island, BC. The reason for an whale to be wake riding is unknown but if you are on a whale watching trip and see this type of behavior, consider yourself lucky as it does not seem to happen on a regular basis. Every day with these wild mammals is different and you are never sure what to expect while out on the vast ocean off Northern Vancouver in British Columbia, Canada.